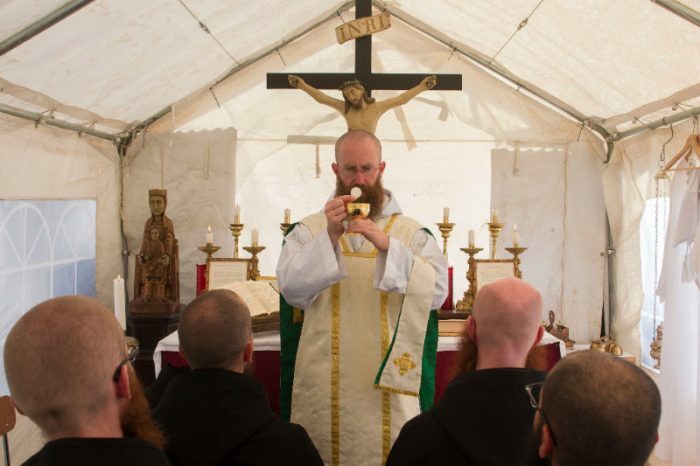 Fr Cassian Folsom, O.S.B., the founder of the Benedictine Monks of Norcia, has just announced two days ago on the community’s blog that he is stepping down as Prior, and that Fr Benedict Nivakoff will become the new Prior. Our readers will perhaps know that Fr Cassian is a cancer survivor; he notes in the following video message that he has NOT had a recurrence. “In the history of every new community, the transition from the founder to the next generation of leadership is a positive sign of growth and maturity. I am happy to announce that the monastic community of Norcia has reached this important moment. The earthquakes of the past several months have presented us with incredible challenges, which require vigorous, creative leadership. While I am in good health at the moment, I do not have the strength or energy necessary to meet these challenges. Therefore it is time to pass the baton to younger, more energetic hands. After consulting the chapter members of the monastery, I submitted my resignation to the Abbot Primate, the Most. Rev. Gregory Polan, O.S.B., who appointed Fr. Benedict Nivakoff, O.S.B., to take my place. Fr. Benedict is extremely well-qualified to lead the community. He has much experience as Subprior and Novice Master, and possesses the human and spiritual qualities necessary to guide the monastery in these difficult times. As for me, after eighteen years of intense labor, I am ready to accept a less demanding assignment, and will continue to serve the community in whatever way I can, especially as a liaison with our many friends and benefactors. NLM offers congratulations to Fr Benedict, and we ask all our readers to pray for him, for Fr Cassian, and the entire community of the Benedictine Monks of Norcia as they rebuild in the wake of the major earthquakes earlier this year which destroyed both their church and monastery.